Developmental monitoring means looking for developmental milestones over time and keeping a record of milestones you see. Developmental monitoring is best done with an objective checklist of typical developmental milestones. and be better prepared to conduct developmental screening with a more formal tool if that is asked of you. 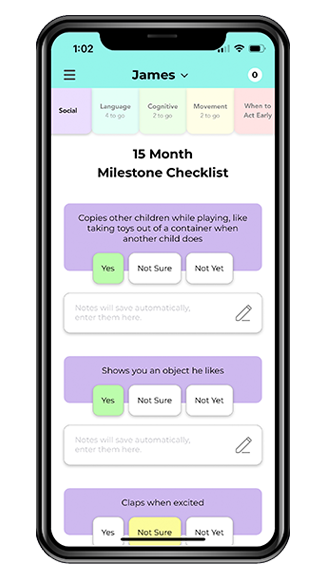 Sharing milestone checklists with families and encouraging them to use them at home can also help parents become better observers of their own children’s development. Using a checklist at home may confirm for families that their child is developing as he or she should, or it may give them the knowledge and self-confidence to talk with you and their healthcare provider about their concerns. However helpful, milestone checklists have some important limitations. Milestone checklists are not validated screening tools. The American Academy of Pediatrics recommends that all children receive a developmental screen using a formal, scientifically tested screening tool at 9, 18, and 24 or 30 months, or whenever there is a concern, and an autism spectrum disorder screen at 18 and 24 months. Using milestone checklists will not satisfy this recommendation. 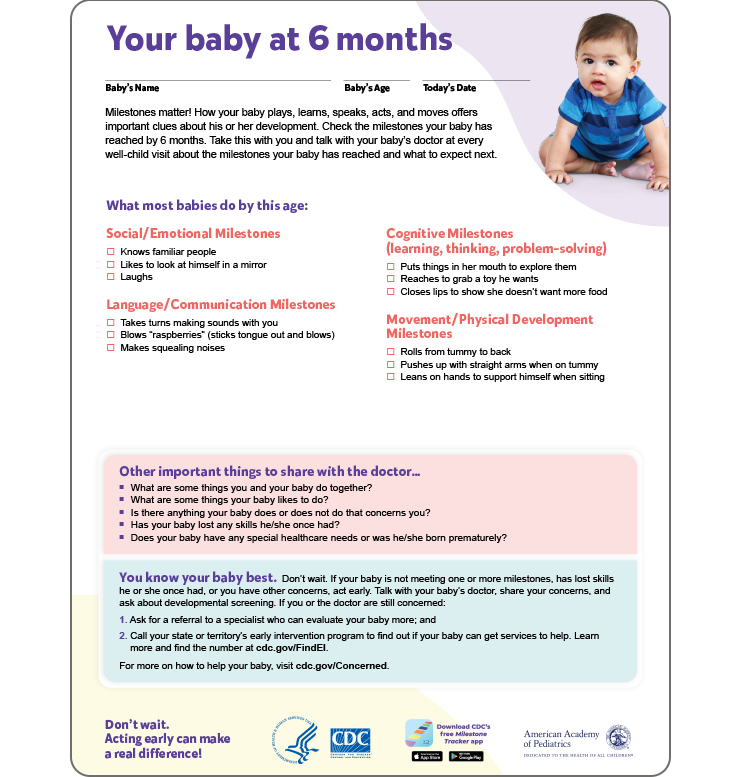 However, using a developmental milestone checklist can help determine if a child needs to be screened more frequently than what is recommended by the American Academy of Pediatrics. You may be required to use a validated screening tool and conduct screening. It is important to follow your employer’s policies regarding developmental screening and communicating with families. Milestone checklists cannot be used to diagnose any developmental disability. Diagnosing a child with a developmental disability often requires an in-depth evaluation by one or more specialists. Different childrearing practices and cultural expectations can influence a child’s developmental milestones. For example, making eye contact or copying others might be examples of developmental milestones that are not typical in some cultures. Developmental monitoring can be easy and fun when you have the right tools. The Centers for Disease Control and Prevention, or CDC, through its “Learn the Signs. Act Early.” program, offers free, easy-to-use milestone checklists, and other materials to help. CDC’s “Learn the Signs. Act Early.” materials, including milestone checklists and other helpful tools, are available at www.cdc.gov/ActEarly. Visit the website to view them, print them, and begin using them today! Milestone Checklists are single-page lists of developmental milestones and warning signs of potential developmental delay for specific ages. If a child is between two ages for which checklists are offered, use the checklist for the younger age (for example, use the 18-month checklist for a 20-month old child, NOT the 24-month checklist). 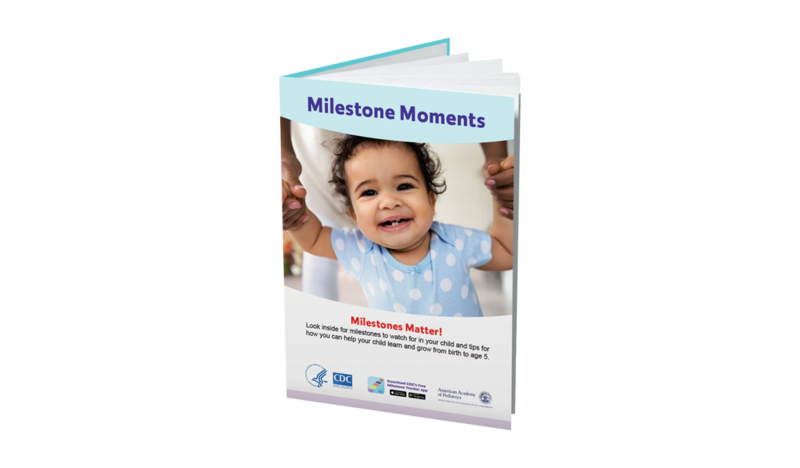 CDC's FREE Milestone Tracker app helps parents and early care and education providers track child’s milestones from age 2 months to 5 years, using a smart phone or tablet. 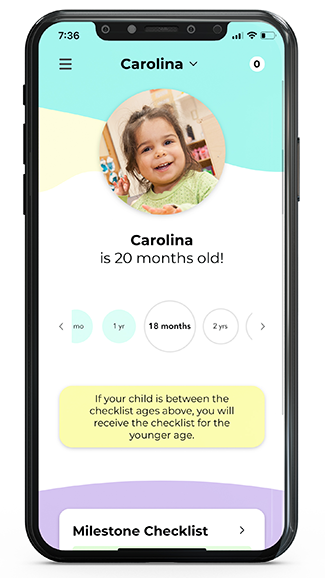 You can use the app to track the milestones of multiple children, view a photo or video of each milestone, quickly reference milestones by age and category, and find out what to do if you are ever concerned about a child's development. Download today from the App Store or Google Play! 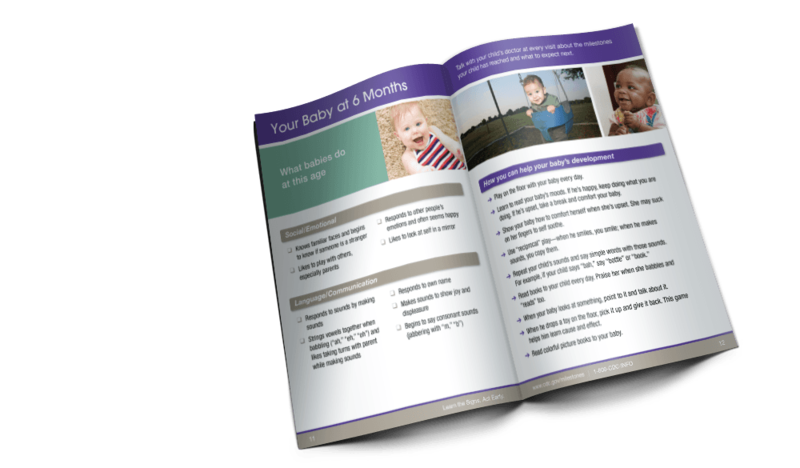 The Milestone Moments Booklet is a 42-page mini-booklet that includes full milestone checklists from 2 months through 5 years of age, with milestones and warning signs for each age. It also includes age-appropriate activities that you can try in the classroom and parents can try at home to help their children learn and grow. This booklet is intended to be kept and used over time. 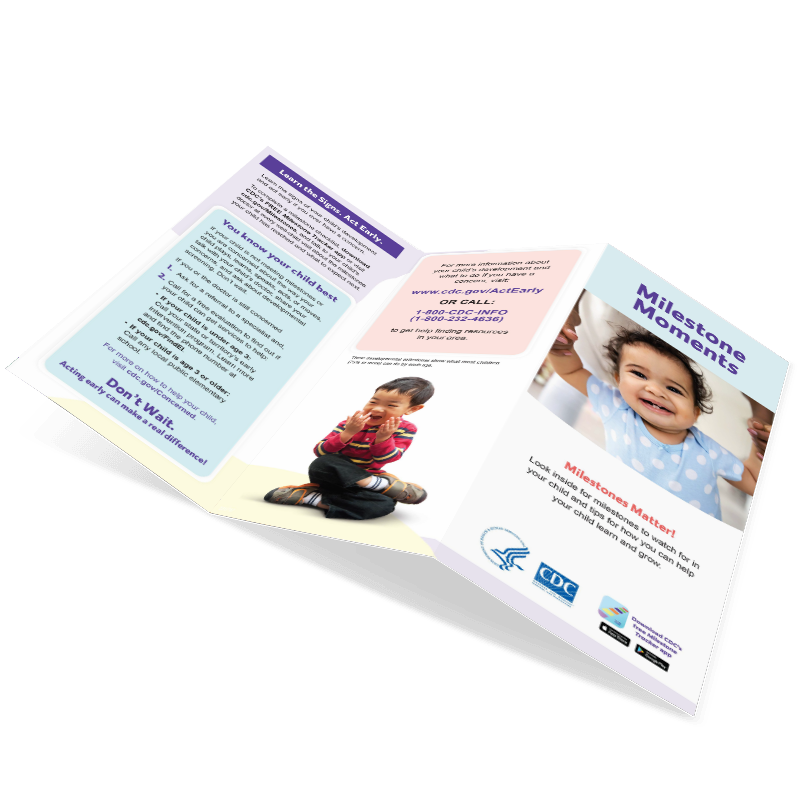 The Milestones Brochure is a colorful and engaging trifold brochure that introduces a few key milestones for ages 6 months to 4 years and explains the importance of looking for milestones and acting early on concerns about development. The Grow Up Healthy! Growth Chart is a engaging display for the classroom and a reminder to watch and record both physical AND developmental growth. It includes recommended immunizations by age and a sampling of milestones that children should reach by different ages. A few times each year, mark each child’s height on the growth chart. At the same time, make a mental note about how each child is meeting or working toward the milestones listed. 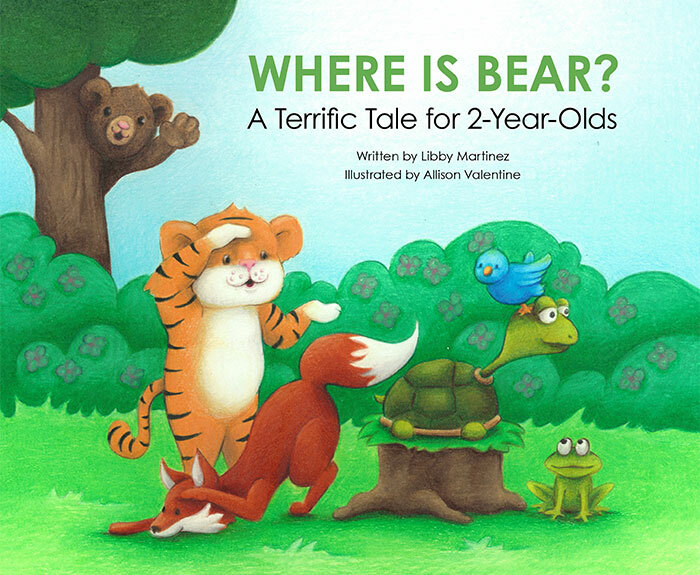 This children's book is a terrific tale for 2-year-old children! 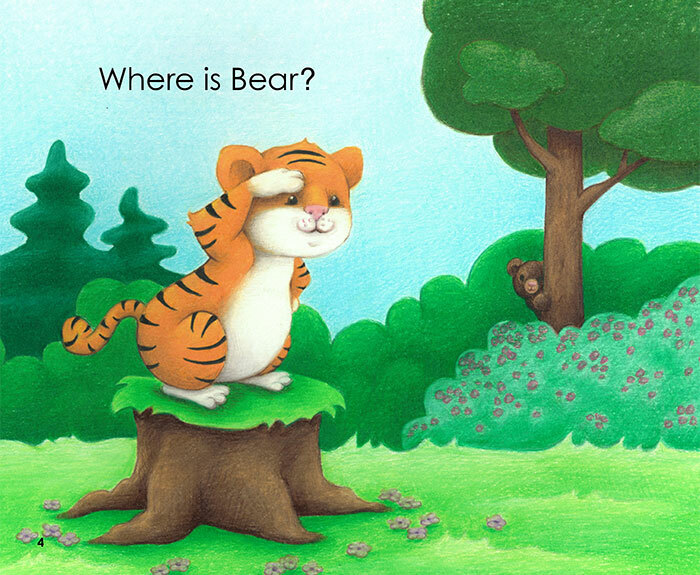 This engaging and interactive book encourages children to help Tiger and his forest friends in their search to find Bear. 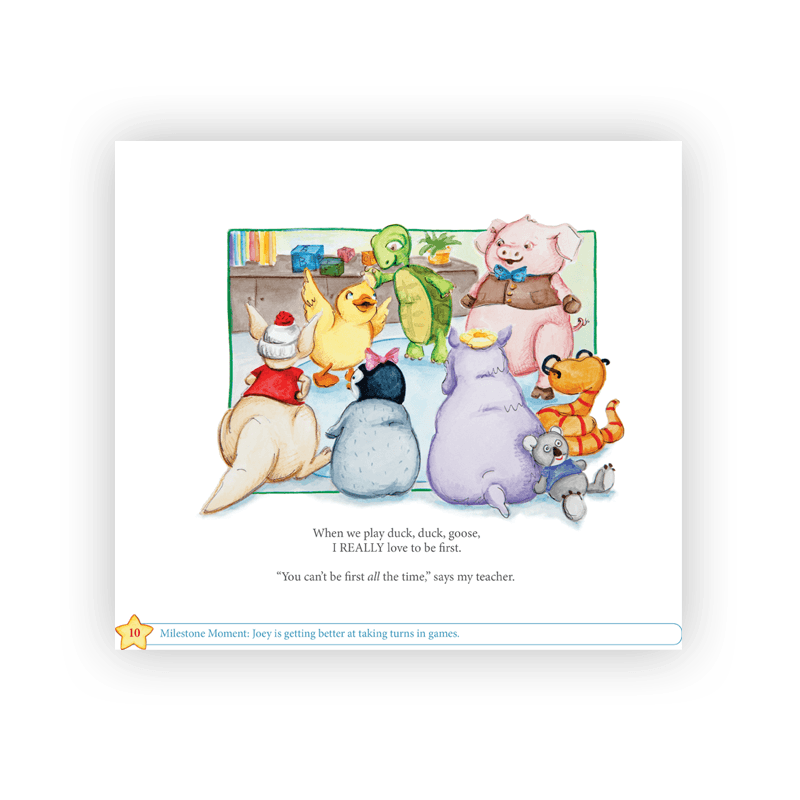 With each turn of the page, children will get closer to finding Bear and teachers and parents will learn about many important milestones to look for in 2-year-old children. Pre-printed copies available free in LIMITED quantities. Tips for Using Where is Bear? 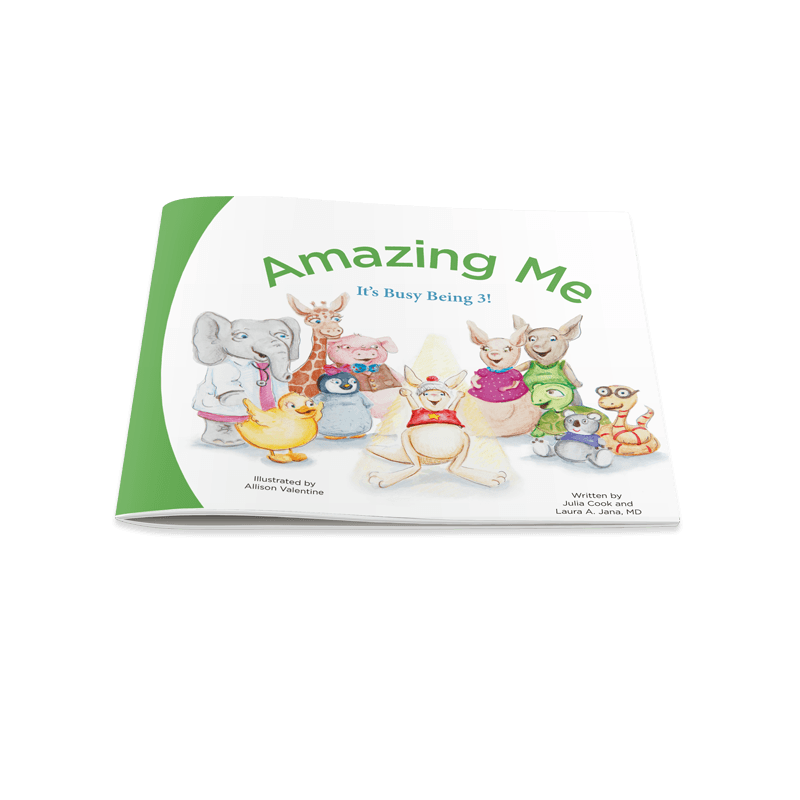 Amazing Me — It’s Busy Being 3! 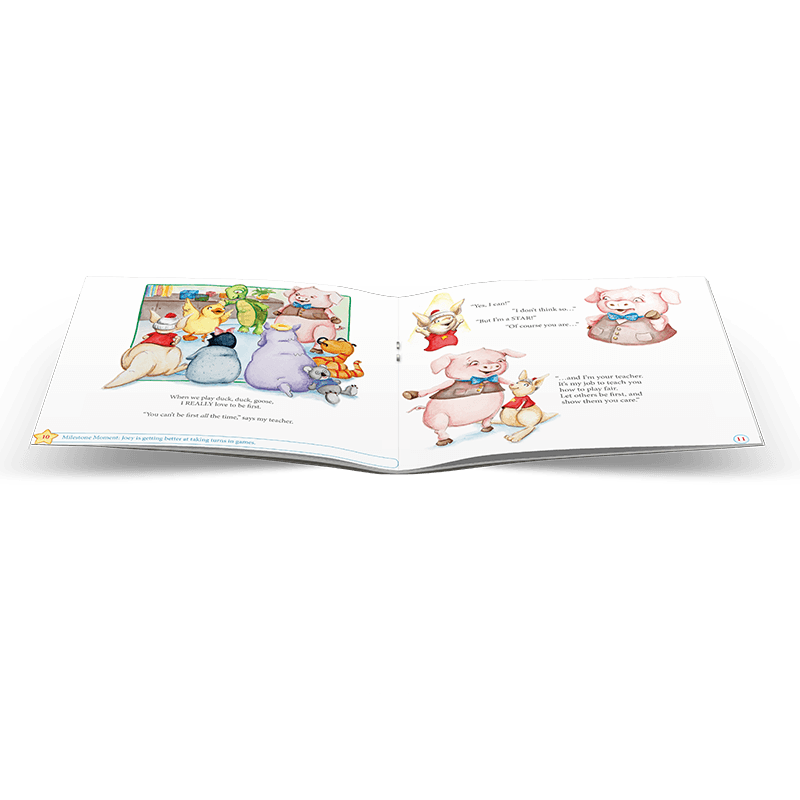 This children’s book, for kids 2½ through 4 years of age, is really AMAZING! It tells the story of Joey and all the things he can do now that he is 3. Throughout the story, Joey’s amazing developmental milestones are called out for teachers and parents at the bottom of almost every page. It’s another great reminder of all the AMAZING developmental milestones to be looking for each day! “Milestone Moments” called out at the bottom of the pages for teachers and parents; and a koala for the children to find each time Joey shows an amazing milestone! Order a copy for the 3-year-old classroom and incorporate it into weekly reading circle time. 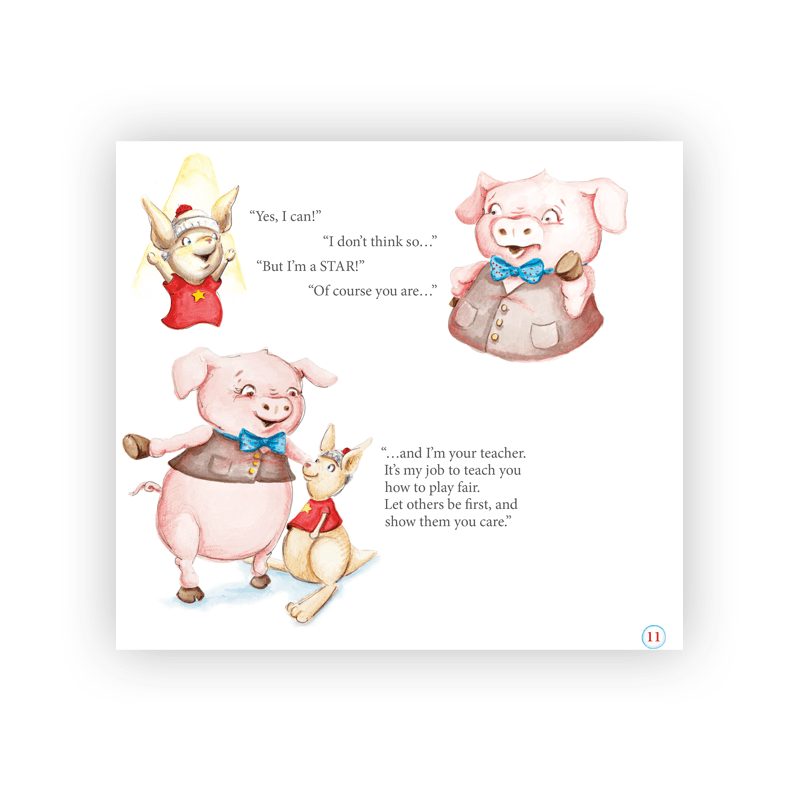 Read it aloud to parents and children in the 3-year-old room during an annual “open house” or other event for parents. Click here to share information with colleagues about the benefits of "Learn the Signs. Act Early." and ways to use these materials in your program. Click here for information about how "Learn the Signs. Act Early." 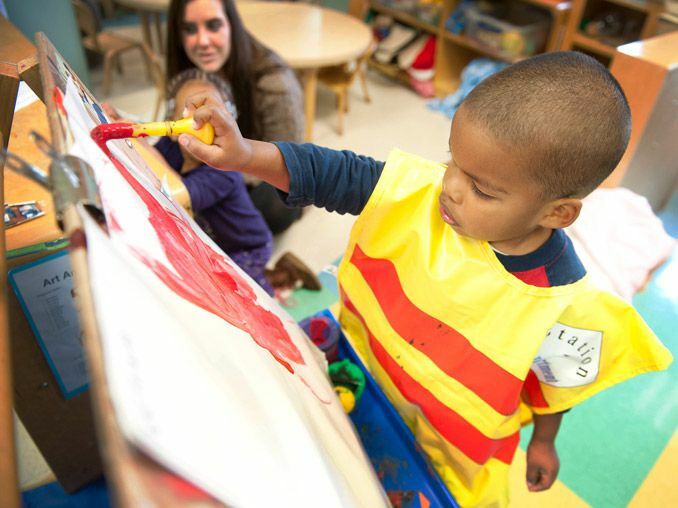 materials can help Early Head Start programs. Click here for information about how "Learn the Signs. Act Early." materials can help meet CCDF requirements. Milestone checklists do NOT take the place of developmental screening with a formal, scientifically tested screening tool. Talk with your employer about how best to incorporate CDC’s “Learn the Signs. 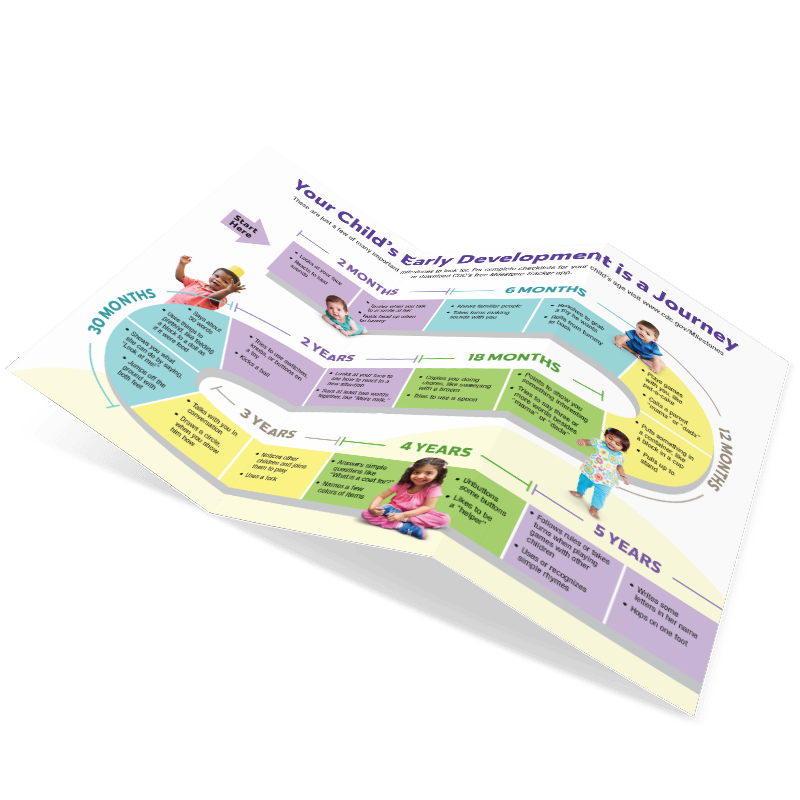 Act Early.” materials into your work and about the possibility of customizing materials and having them printed locally, using information from the Early Care and Education primer. If a child was born prematurely it may be best for parents to ask the doctor for guidance on how to use milestone checklists. Depending on the child's situation and doctor's guidance it may be best to use the checklist age that matches the child’s adjusted age (based on due date) not his or her chronologic age (age based on birthdate) for the first 2 years. At some point, there are likely to be children in your care who are not meeting developmental milestones as expected. You can play an integral role in helping these children get the help they might need to reach their full potential. Supporting a family with your encouragement to act early on concerns about a child’s development is a critical step toward helping a child get the early services he or she might need. A first step in supporting a family to act early is to understand the process of referrals and next steps so that you can help families navigate through it. You’ve learned about developmental monitoring and how to do it earlier in this module. It is important for parents to talk with their child’s doctor about the milestones their child has reached and what to expect next. Ask families to take their milestone checklists to their child’s primary healthcare provider or medical home. It is especially important that parents have that conversation if they are concerned about their child’s development. If you or someone in your center conducts developmental screens for the children in your care, be sure to give the parents the screen result and encourage them to share that information with the child’s doctor. If you don’t conduct screening, encourage the family to ask their child’s doctor about conducting a developmental screen. If the family does not have a regular doctor for their child, you can help them find one at the National Center for Medical Home Implementation website. The child may also be referred to a specialist such as a developmental pediatrician, child neurologist, or child psychologist for a more in-depth medical evaluation that may lead to a specific diagnosis of a developmental disability or other condition. Usually only a pediatrician, family practice doctor, or other healthcare provider refers a family to a medical specialist. 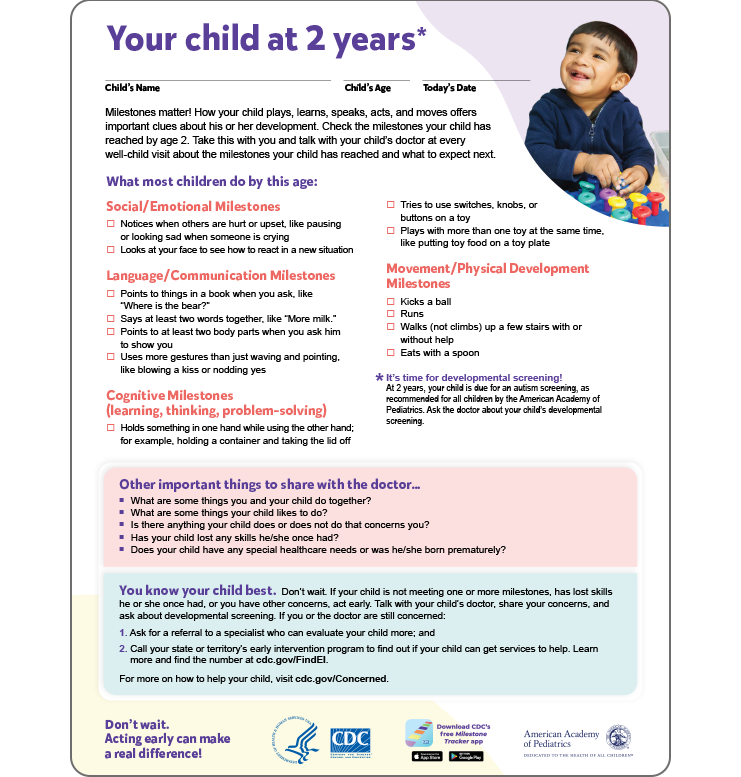 If a parent is worried about his or her child’s development, or if results of developmental monitoring or screening indicate developmental concerns, then you can encourage the family to call their local early intervention provider or local elementary school for a more detailed developmental evaluation to see if he or she would benefit from services such as speech therapy, physical therapy, or other specialized services. The evaluation is free or low cost if conducted by the local public early intervention system or public school system. It determines whether a child is eligible for services but does not usually provide a diagnosis of any specific developmental disability. If you work in a child care center or for another employer, make sure you know your center's policies. 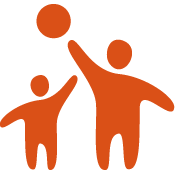 Be aware of your center’s referral procedures, and let your supervisor know you plan to refer a parent to early intervention services. 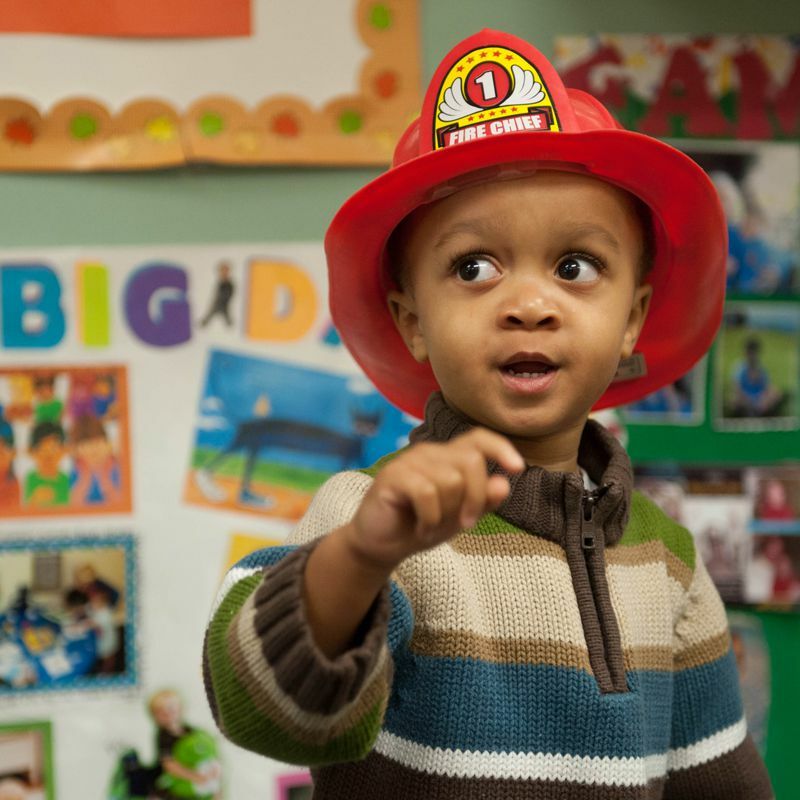 If the child is younger than 3 years old, contact your local early intervention system. Click here to find the website and phone number for your state or territory’s early intervention system. If the person who answers is unfamiliar with preschool special education, parents should ask to speak with the school or district’s special education director. Parents do NOT need a doctor’s referral or medical diagnosis to contact their early intervention system or public school to request an evaluation for services. Choose one “Learn the Signs. Act Early.” material and describe how you can use it in your work with children and parents. List the steps you need to get this started. I choose the Milestones Brochure. Are you ready to take the quiz now? You must pass all module quizzes to receive continuing education credit.